One of the attributes of God that Jesus demonstrated is Justice. The word means fairness, also having the connotation of prosperity in the sense of restoring what has been stolen, or granting what is our inheritance. The concept of justice or discernment implies that there is a right and wrong, and we can tell what it is. Righteousness is a state of forgiveness and right standing, but justice is an act of setting a wrong situation right. The influence of secularism, relativism and multiculturalism has led to a belief that we have no right to discern good from evil and, therefore, no basis from which to act upon it. The further implication is pacifism and a form of dualism, whereby we delegate the fight to God and allow injustice to grow unchecked. The truth is that we can discern injustice and God expects us to act. Culturally, we refrain from celebrating those in our culture who maintain justice – namely the police and the military. The reality is that those who maintain justice occupy a cultural mountain that is spiritual, and their role is a ministry. Like every other mountain, we need Christians to lead them if we expect justice to be maintained. There is a great deal of Godly authority and anointing for those in the political, military and justice departments to maintain a Godly standard of justice. Countless times in military history God has intervened in miraculous ways… the battle of Midway in WWII is one of my favorites. Neville Chamberlain is my favorite cowardly fool who proved once again that compromise and appeasement with the devil is not possible. It is also true that when God’s people have refused to confront evil the incredible injustice of gas chambers and genocide has resulted, and blood of millions rests on our hands. When the righteous will not stand for liberty and justice, the enemy always fills the gap with killing, stealing and destroying. Iran and Ukraine are present day examples. The price of liberty really is eternal vigilance. As believers there is no such thing as “war-weary.” Demons don’t take vacations. We expect to resist the devil spiritually and practically, and we expect to see him flee. This is not an hour for spiritual leaders to be silent. Being Christ-like is being full of grace, mercy and truth. But Jesus was not shy about discerning the true nature of people and telling it like it is. The fruit of discernment is justice. When we tolerate evil under the banner of being inclusive and non-judgmental, we are only fooling ourselves. 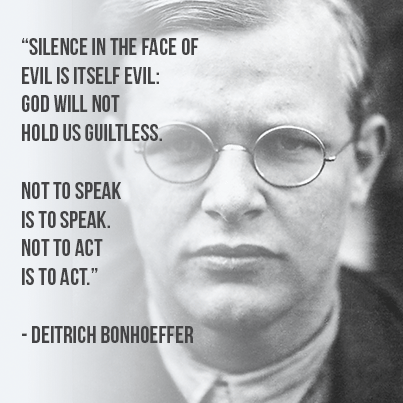 Deitrich Bonhoeffer was a German Lutheran pastor, theologian, anti-Nazi dissident… Apart from his theological writings, Bonhoeffer became known for his staunch resistance to the Nazi dictatorship, including vocal opposition to Hitler’s euthanasia program and genocidal persecution of the Jews. Allegedly associated with the plot to assassinate Adolf Hitler by members of the Abwehr (the German Military Intelligence Office), Bonhoeffer was arrested in April 1943 by the Gestapo, imprisoned at Tegel prison for one and a half years, and then in a Nazi concentration camp, and after a very brief, biased trial with other plotters as the Nazi regime collapsed, executed by hanging on April 9, 1945, just two weeks before Allied forces liberated the camp and three weeks before Hitler’s suicide.